With the weather heating up (and it is scorching here already!) I’ve got light, bright, fresh, raw salads, salsas, and sauces on the brain. I whipped up this delicious Black Bean and Corn Salsa to top the fish tacos that I just posted about, but I was also eating the leftovers with tortilla chips as a dip. It would be great with grilled chicken or fish as well. In addition to the black beans and corn, I also included pineapple for a hint of sweetness, tomato, cilantro, and lime juice. I could seriously eat this one way or another every day of summer. What are your favorite bean recipes? Link them up in the blog hop below! This light, fresh black bean and corn salsa makes a great topping for fish tacos or grilled chicken, but is also perfect with tortilla chips. Toss to combine. Season with additional salt, pepper, or lime juice as needed. Hello Katherine, I’m making this salsa but without pineapple, I’m going to try it with the fruit next time! Hi Eri! Yes, the pineapple adds a nice, bright touch and just a bit of sweetness. Have a great week! This salsa looks terrific! Thanks for the link up! Too funny, Julie, I also linked up my beany dessert! I’m so happy there are a few bean-rich desserts on here! I can’t wait to try them! Thanks Julie – sooo happy you linked up some dessert here! Love corn and black bean salad. The pineapple is a great addition. Yum – love corn and black beans together, definitely a winning combination! Also – trying to link up, but there’s no button to do so like there usually is. Am I the only one encountering this issue? Thanks Willow!! Also, yikes! A few people have emailed me and indeed the hop seemed to have malfunctioned. I think I’ve fixed the issue and it should be up and running now but let me know if you have any other issues linking up! As always, thanks for hosting Katherine! What a great twist to the classic black bean salsa – pineapple! I’ve added mango, but pineapple sounds very interesting. HUM! Might have to try it. 🙂 Timing hop topic – we’re having pinto bean tostadas for supper tonight so I’ve linked up my black bean tostada to your hop. Great hop topic! Have a wonderful weekend! Thanks MJ! Mango sounds amazing too. Mmmm your tostada sounds awesome, thanks for linking up! And thanks for linking up Lisa! Gorgeous photo as always! Love linking up to your parties! Katherine, this is my kind of salsa–I don’t like tomato-heavy ones. Black beans and corn are the perfect salsa base in my opinion. I love the addition of pineapple! So many great bean recipes to check out – exciting! 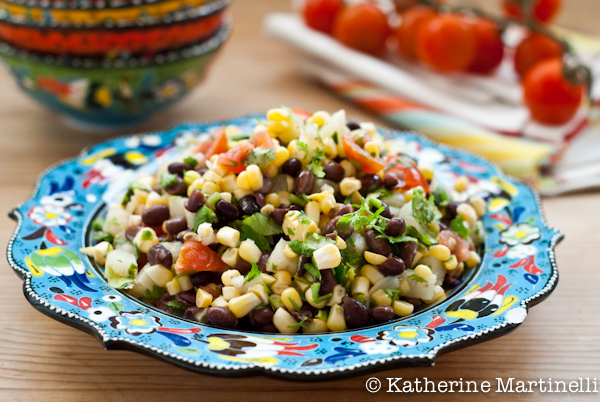 Amazing – the black bean & corn salsa looks great, but the choice of blue plate for this dish is just perfect. I really love this picture Katherine! I never had salsa with pineapples in it. What a creative addition! Have a great weekend! Another great idea! I posted the 7 layer burritto! Thanks Bree! Cannot wait to try that burrito – thanks for linking up! This is really a creative use of flavors! I have seen this type of salsa but never with the pineapple in there. That addition does make it so much better as far as I am concerned. Thanks for posting this, I appreciate this better recipe for salsa! Enjoy the weekend! Thanks Tina! Yes, I love the pineapple in there. It really does make it even more special. My version does not have pineapple, but that’s such a yummy addition! A must try for the summer 🙂 Have a lovely weekend! Your salsa is gorgeous! Thanks for hosting the Bean Blog Hop- so many great recipes! What a perfect salad for the summer. Love your platter, too! Thanks Laura! I got the platter in Istanbul, they have the prettiest things! fantastic that looks absolutely delicious, beans are fantastic. Thanks for sharing the recipe, I will be sure to make it in the near future. Thank you Raquel!! I hope you enjoy it! I love sweetcorn and pineapple salsa, but never add black beans to it….thanks for sharing the recipe…must give it a try…. :-)Loved the bowl you served it in, is it Mexican? My pleasure I hope you enjoy! And thanks – I got the bowl on my recent trip to Istanbul! They have the most gorgeous ceramics there and so inexpensive. It was only a few dollars! Thanks Raji!! It’s my new serving bowl and I love it too! It’s from Turkey! I love love this kind of salsa, way better and delicious than the tomato ones. I could eat this all day! I totally agree! Thanks Jenny! What a refreshing colorful salsa Katherine! Very appropriate for this time of the year! A very colourful and appetizing salsa! The serving plate looks beautiful too. Your plates are fabulous. I have some similar that we purchased in Mexico. I could eat this dish every day as well…with a chip or just with a spoon. Just tried fish tacos out on the Oregon Coast last week. Yum! This sounds incredible K! I haven’t seen so many bean recipes together. Thank you for hosting this bloghop. I’m going to bookmark this right away. So happy you like it and are as inspired by the blog hop as I am! I love salsa of every description. And I just happen to have a load of fresh pineapple right now. Hmm, I wonder what’s for dinner tonight? Good recipe – thanks. This looks incredibly delish especially with the pineapple! A must try for me! what a beautiful & refreshing salsa! adore the bright colours of the plate and bowls!